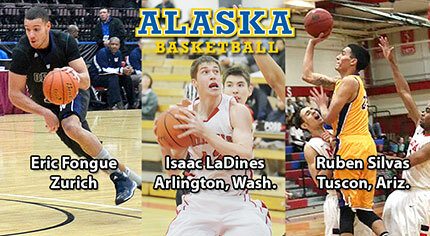 FAIRBANKS, Alaska — The Alaska men’s basketball team added more depth and experience for next season, as head coach Mick Durham announced the signing of three junior college transfers – Eric Fongue (Zurich), Isaac LaDines (Arlington, Wash.) and Ruben Silvas (Tuscon, Ariz.) – to National Letters of Intent for 2014-15. "They are good, solid character guys, they’re good in the classroom, and that’s exactly the type of guys we’re looking to continue to bring into our program," said Durham of the trio. Fongue is a 6-foot-6-inch All-Northwest Athletic Association of Community Colleges forward who played for Whatcom Community College in Bellingham, Wash. Fongue, who hails from Zurich, Switzerland, shot 47.4 percent last season, including 44.6 percent from beyond the 3-point line (41 for 92). He averaged 11.4 points and 5.7 rebounds a game while helping lead Whatcom CC to the NWAACC North Region title and a spot in the NWAACC Championship Tournament. The Orcas finished with a 19-8 overall record and 11-3 conference mark in 2013-14. "We’re very excited," said Durham of Fongue’s commitment. "He brings us some experience, he brings us some maturity. I think he does a good job of stretching the defense with his 3-point shooting, yet I think he can guard down low. He’s a very good student and he’s someone that we targeted for a while." Along with being named Second Team All-NWAACC North Region, Fongue earned NWAACC All-Academic accolades. He had 16 games of double-figure scoring last season including two double-doubles. Fongue scored a season-high 22 points on 9 for 11 shooting versus Peninsula College on Jan. 4. LaDines, a 6-foot-8-inch center out of Skagit Valley College in Mount Vernon, Wash., was also named to the 2013-14 NWAACC All-Academic team. He was a 57.5 percent shooter from the floor last season, averaging 7.8 points and 4.6 rebounds a game. LaDines turned in 16 games with at least five rebounds, including five straight from Jan. 8-22, a streak during which he averaged 7.2 boards per contest. "Isaac is a kid with a big upside," said Durham. "He’s a legit center and the coaching staff there, Coach Veltri, did a great job with him this year. I think they’ve really developed him not only offensively but defensively. He runs the floor real well and I do think he’s developing with his low-post game." LaDines had six games last season with at least 10 points and five boards, including a double-double on Jan. 22 against Bellevue College. He also averaged 9.9 points and 5.6 rebounds per game his freshman year in 2012-13 and shot 47.4 percent for the season with 12 double-figure scoring games. Skagit Valley finished tied with Fongue’s Whatcom CC team for first place in the NWAACC North Region last year at 11-3 in conference. The Cardinals went 20-11 on the season, making it all the way to the championship semifinals before falling to eventual winner Portland Community College. Silvas, a 6-foot-3-inch guard, comes to the Nanooks from Tohono O’odham Community College in Sells, Ariz., outside of Tucson. Silvas is the first member of the Pascua Yaqui Tribe to earn a college basketball scholarship. During the 2013-14 season he averaged 11.6 points, 5.3 rebounds and 2.1 steals per game as a starter for the Jegos. He was 56.7 field goal percentage shooter, including 47.4 percent from 3-point line. He also averaged 9.7 points and 4.0 boards per contest as a freshman in 2012-13 and was a 57.6 percent shooter. "It’s a great opportunity for Ruben," said Durham. "We need some help on the wing and I think he can play some wing, some big guard. He’s just one of those guys you like on your team. He’ll keep the defense honest shooting the 3, but he’s very active on the offensive glass. He’s long, so defensively he’s going to be solid." Silvas comes from the same conference that 2014 Great Northwest Athletic Conference Defensive Player of the Year Andrew Kelly (Gilbert, Ariz./Justice) came from, the Arizona Community College Athletic Conference. Silvas’ TOCC team went 19-13 overall, 15-8 in conference last season and made it to the conference championship game, where they lost to eventual national champion Phoenix College. "It is a league that stays hidden a little bit," said Durham of the ACCAC, "and we’ve had some pretty good success with Andrew and now Ruben. It’s an area that you think wouldn’t be a fit because of the weather, but it’s a good league."